DeWalt DCK699M3T-GB 18v XR 6 Piece Kit 3 x 4.0Ah Li-Ion. 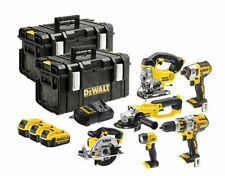 A Great Mixed 18v XR Cordless Power Tool Kit from Dewalt! Perfect for professionals to complete their kit or for DIY enthusiasts to increase their collection. Condition is New. DeWalt 18 Volt Li-ion Cordless 6 piece Kit - DCK694P3. Latest generation 18V XR Li-Ion Brush-less Impact Driver. 13 mm ratcheting key-less chuck with automatic spindle lock for fast bit changes. DeWalt 18V 3x5.0Ah Li-ion 6 Piece Kit - DCK665P3T-GB. 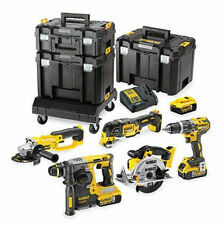 It will accept any of DeWalt's family of 18V XR Li-ion batteries so you can mix and match with your current tool collection. 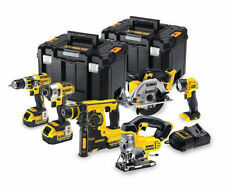 This 6 piece set from DeWalt contains everything you need to start off a serious power tool collection. Dewalt DCK699M3T 18v Cordless Li-Ion 6 Piece Power Tool Kit 3x 4Ah Batteries. 3 LED 'Halo' ring provides maximum illumination of work piece. Spindle lock for quick and easy blade change. Variable speed trigger. DEWALT DCK699M3T Cordless Kit. Condition is New. Dispatched with Royal Mail 1st Class. 2 x 1-70-322 TOUGHSYSTEM DS300. 18V Brushless Motor. Battery Chemistry: XR Li-Ion. Battery chemistry: XR Li-Ion. Spindle Thread: M14 (22 mm). 1 x DCS367 18V XR Compact Reciprocating Saw. 1 x DCF887 18V XR 3-Speed Impact Driver. 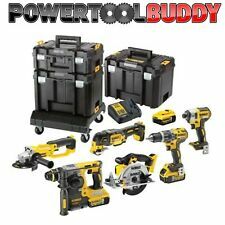 DCK665P3T XR Compact 6 Piece Wood Working Kit 18 Volt 3 x 5.0Ah Li-Ion. 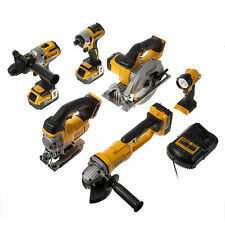 The DEWALT DCK665P3T XR Compact Wood Working Kit, contains the following DeWalt 6 Piece XR Compact Wood Working Kit. 1 x 18 Volt DCS331 XR Premium Jigsaw is designed for efficiency and has a powerful and highly efficient DEWALT PM47 fan-cooled motor with replaceable brushes. DeWalt DCK691M3 18V Li-Ion Cordless 6-Piece Kit XR 3 x 4.0Ah. Condition is New. Collection in person only. 2x TSTAK VI Kit Boxes. 1x TSTAK II Kit Box. 1x TSTAK Carrier Trolley. Battery Compatibility: 18v Lithium-Ion (XR). Blows Per Minute: 4500. 1x DCF887 Brushless Impact Driver. Impact Energy: 2.1j. Max Bit Capacity in Wood: 26 mm. 3x DCB184 18v 5Ah Li-ion XR Battery. DCD996N 18v Body Only XR 3 Speed Brushless HD Combi Drill. DCF887N 18v Body Only XR Brushless 3 Speed Impact Driver. DCS331N 18v Body Only XR Jigsaw. DCS391N 18v Body Only XR 165mm Circular Saw. Dewalt DCK699M3T 18 V Cordless Kit (6-Piece). - 2 x TSTAK VI Kit Box. - DCS391 Circular Saw. - DCS331 Jigsaw. DeWalt DCK694P3 18v Cordless 6pc Kit 3 x 5.0AH Li-Ion. 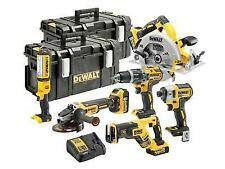 DeWalt 18 Volt Li-ion Cordless 6 piece Kit - DCK694P3. This 6 piece kit is ideal for professionals and DIY enthusiast alike due to the robust nature these tools are made they can withstand forceful work and maintain the precision that we can rely on from Dewalt. 18V Brushless Motor. High power Brushless motor outputting up to 205Nm of torque ensures heavy applications are completed quickly. Brushless Motor Technology for excellent efficiency. 4-position blade clamp - allows cutting from angle and improves access to cut making it easy to use in many applications. The 6 piece set brings together the two (to date) best performing brushless heavy duty combi drill and impact driver from Dewalt, along with 4 other popular cordless XR 18v li-ion tools. The Jigsaw, Circular Saw, Ginder and Torch. Warranty info. DCG405 Grinder, DCS367 Recip saw. The DEWALT DCK699M3T XR 6 Piece Kit, contains the following DeWalt 6 Piece Power Tool Kit. 1 x 18 Volt DCF886 Brushless Impact Driver with brushless motor technology, aluminium front housing and an ergonomic handle. Dewalt DCF887 Impact Driver. Dewalt DCS391 Circular Saw. Dewalt DCG412 Angle Grinder. Dewalt DCS331 Jigsaw. Dewalt DCL040 Torch. Dewalt DCF887 Impact Driver Larger brushless motor than previous model gives 34% increase in power. The DEWALT DCK694T3 Brushless 6 Piece Kit, contains the following This is achieved through 3 motor speeds and torque settings. It has a super lightweight and compact design. It has a spindle lock for quick and easy blade change. Latest generation 18V XR Li-Ion Brush-less Impact Driver. 13 mm ratcheting key-less chuck with automatic spindle lock for fast bit changes. Powerful & highly efficient PM58 DeWalt fan cooled motor with replaceable brushes. The DEWALT DCK694P3 Brushless 3 Speed 6 Piece Kit, contains the following 1 x 18 Volt DCF886 Brushless Impact Driver with brushless motor technology, aluminium front housing and an ergonomic handle. Dewalt DCK694P3 18V 6 Piece Kit 3 x 5Ah Batteries Tstak Kitboxes. Dewalt DCF887 Impact Driver. Dewalt DCS391 Circular Saw. Dewalt DCG412 Angle Grinder. Dewalt DCS331 Jigsaw. Dewalt DCL040 Torch. Dewalt DCF887 Impact Driver. The DeWalt DCK692M3 18 Volt Kit contains the following Impact Driver. Black & Decker. 2 x Tough System Kit Boxes. DCF885 Impact Driver. Work Wear & Safety E. 2 x DS300 Tough System Kit Boxes. DCL040 LED Pivot Light. • DCG405 18v XR 125mm Small Angle Grinder. • DCS367 18v XR Compact Reciprocating Saw. • DCS570 18v XR 184mm Circular Saw. • DCF887 18v XR 3 Speed Impact Driver. • DCL050 18v XR Handheld LED Area Light. • Latest generation 18V XR Li-Ion Compact Impact Driver. • 13 mm ratcheting keyless chuck with automatic spindle lock for fast bit changes. • Latest generation 18V XR Li-Ion premium Grinder. • Latest generation 18V XR Li-Ion premium Jigsaw. 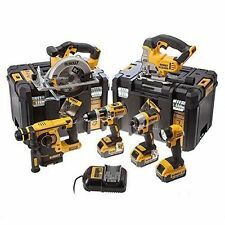 DeWalt 6 Piece XR Compact TSTAK­?. Kit - 18 Volt 3 x 5.0Ah Li-Ion - DCK654P3T. DCK654P3T XR Compact TSTAK­?. Kit 6 Piece 18 Volt 3 x 5.0Ah Li-Ion. The DEWALT DCK654P3T XR Compact TSTAK­?. Kit, contains the following. • Combi drill & impact driver have brushless motors for maximum efficiency. • 2 x TSTAK VI Kit Boxes. • Comprehensive drilling and driving options for all standard materials. • DCF886 Brushless Impact Driver.